Despite the known harmful consequences, the use of tobacco is one of the largest public health threats world over. Tobacco which is primarily used in smoked and nonsmoked forms, it is one of the most important causes of morbidity and mortality, killing more than 7 million people per year with half of all deaths occurring in developing countries. According to a report, in India, a developing nation, with a large section of the population belonging to low socioeconomic status, various forms of tobacco use leads to 800,000–900,000 deaths annually in India due to use of different forms of tobacco. The World Health Organization has emphasized the prevention of tobacco use and tobacco cessation counseling guidelines as the priority goals in dentistry today. The United State Public Health Service has issued clinical practice guidelines for treating tobacco use and dependence. Despite these, there continues to be confirmation that dental professionals do not possess the appropriate education and training needed to assess the use of tobacco and provide proper tobacco cessation interventions. Fortunately, in recent years, dental education has made good progress in preparing the next generation to offer effective tobacco cessation interventions during their clinical training. Overall implementation of tobacco cessation as fundamental in dental practice is generally lacking. This necessitates the involvement of dental students in playing a pivotal role in reducing tobacco use by counseling their patients. The present study was designed to assess the attitude, practice, and barriers of dental students in SCA to the patients. Education and training regarding tobacco use and cessation are desired to be provided to the dental students throughout the dental curriculum in both theoretical and clinical perspectives. A questionnaire-based survey was conducted among clinical dental students (3rd year BDS, Final year BDS and House surgeon) of Hazaribag College of Dental Sciences and Hospital; Hazaribag, Jharkhand, India. All the students and interns present on the day of the survey were included in the study. The study populations were approached directly by the researchers and asked to answer the questionnaire in the presence of the researcher. Before the survey, the ethical clearance was obtained from the Institutional Ethical Committee of the college and informed consent was taken from participating students. All the clinical dental students and researchers were present on the day of the survey. 1st and 2nd year students as they are not exposed to clinical works yet. The prefabricated questionnaire consisted of 25 multiple choice questions, based on Likert scale. These consisted of questions for assessing attitude (6), Practice (14), and barriers (5) regarding SCA [Figure 1] and [Figure 2]. The questions used were mainly close-ended. In the beginning of the questionnaire, the personal information regarding the respondents was obtained such as year of study, gender, and age. 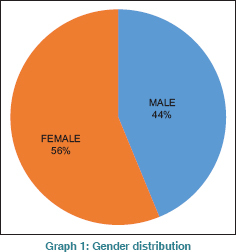 Among the 217 participants in the study, 56% (n = 122) were female and 44% (n = 95) were male [Graph 1]. The participants were aged between 20 and 27 years. 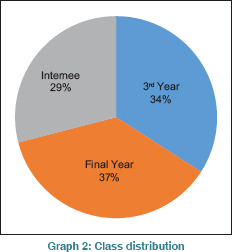 Over 37% (n = 80) of the number of respondents were final year students. 34% (n = 74) were 3rd year students and 29% (n = 63) were house surgeons [Graph 2]. Students showed positive attitude toward “How much is your responsibility as a dental student in smoking cessation counseling?” And “How confident you are in your ability to effectively offer smoking cessation counseling?” with maximum balloting toward considerable (35.94% and 42.86%) and great extent (56.68% and 23.96%). Whereas for some questions like “How effective do you think smoking cessation counseling provided by dentist?” “Do you think patients expect SCA from dentists?” “How optimistic you are in patient's ability to change their smoking habits?” And “Are there adequate opportunities available to you for training in smoking cessation and prevention counseling? Majority of students trusted on neutral answers of “to some extent” (50.23%, 39.17%, 40.55%, and 25.35%, respectively) [Figure 3]. 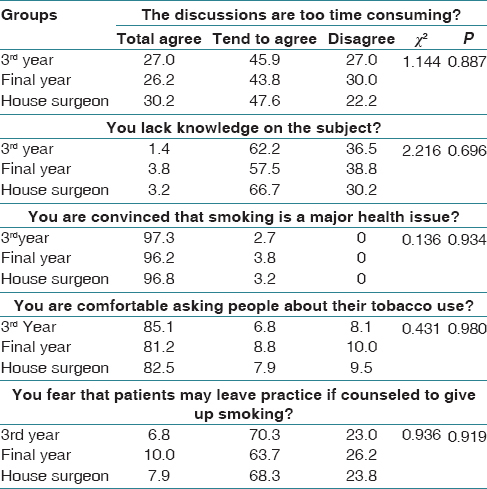 Overall, the attitude of house surgeons was better than that of third and final year students for questions based on attitude toward smoking cessation questions like: How effective do you think smoking cessation counseling provided by dentists? (P < 0.05) [Table 1]. Practice in tobacco smoking cessation designates the attitude and practice among the student population. 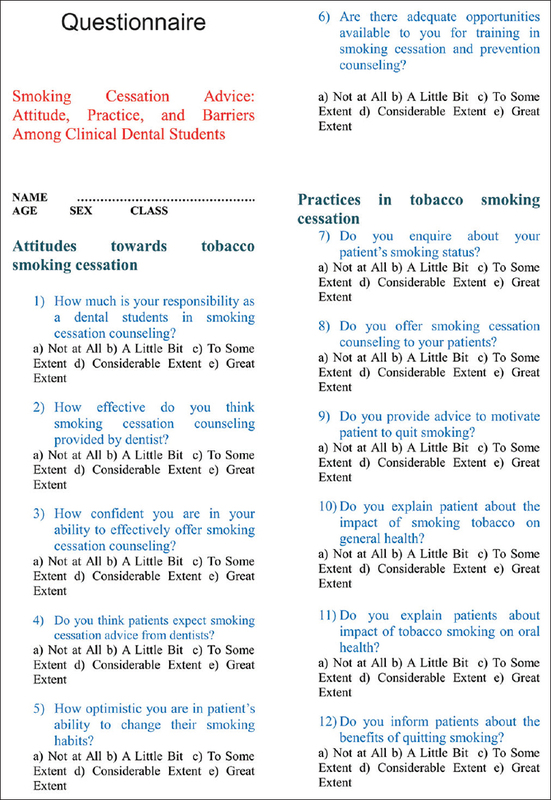 The present survey displayed that most of the students were having constructive attitude toward tobacco smoking cessation by balloting “considerable and great extent.” Students displayed their confused or balanced opinion by balloting “to some extent” option to the questions such as “Do you offer smoking cessation counseling to your patients?” “Do you assist the patient who smoke to give up?” “Do you refer patients to appropriate services to help them stop smoking?” “Do you keep record of patient smoking status?” and “Do you recommend the use of approved pharmacotherapy accept in special circumstances?” [Figure 4] Overall based on practice in tobacco smoking cessation for questions like: Do you refer patients to appropriate service to help them stop smoking? P < 0.05 were statistically significant. There was a positive opinion on practice in tobacco smoking cessation in house surgeons followed by final years and 3rd year students [Table 2] and [Table 3]. Majority of students agreed on the fact “that smoking is the major health issue” and “you are comfortable to asking people about their tobacco status” (96.77% and 82.95%) and also showed their neutral opinion on “The discussions are too time-consuming” “You lack knowledge on the subject” And “You fear that patients may leave practice if counseled to give up smoking” [Figure 5]. 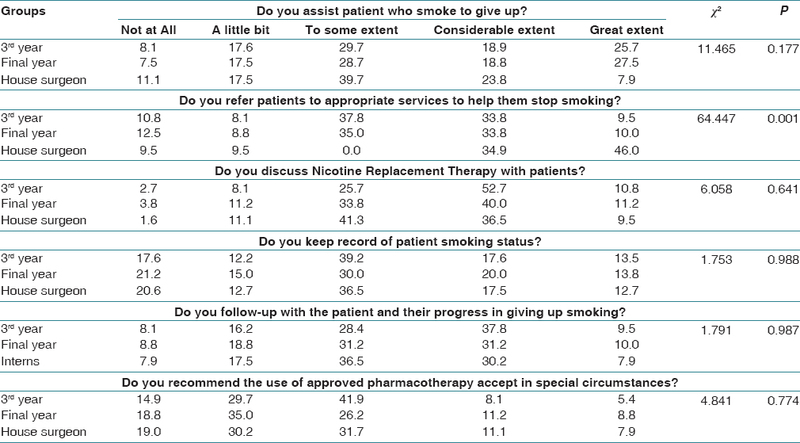 Among clinical students 3rd year and final year faced maximum barriers in as they fear that patients may leave practice if counseled to give up smoking [Table 4]. The dental professionals can play an important role in smoking cessation and prevention. This survey of clinical dental students regarding knowledge, attitude, and practice toward SCA clearly show that the dental students have good knowledge of the effects of tobacco use on oral as well as on general health. They have shown positive attitude toward providing SCA to their patients. A study done by Wyne et al. revealed confusions in the dental community regarding the extent of the dental professionals responsibility and role in tobacco intervention. Only a minority of them thought of tobacco intervention as their responsibility to a “great extent.” Several other studies in other countries have also led to similar results and reported that the dental professionals were uncertain of their role in providing SCA to the patients, and believed that it was not a part of dentistry.,,, The attitude of dental students in taking responsibility for smoking cessation in the present study was generally promising. The result of the present survey is in line with similar to several other studies previously carried out in different parts of the world,,,, where dentists generally believed that it was also their responsibility to help their patients in smoking cessation or to prevent tobacco use in their patients. The dental team could play an important role in encouraging patients to quit using tobacco as they recognize and point out the damage caused by tobacco to the oral tissues and could highlight the general health benefits of quitting and to refer to professional cessation services if appropriate. The present survey revealed that the participating clinical dental students had a good level of knowledge about potential health implications for tobacco users. The majority of participants correctly identified tobacco use with a variety of dental and other pathologies. Considering that at the time of the survey some of the students of the 3rd year had not completed the clinical posting in the department of oral medicine, the results of this survey are encouraging. Although the majority of students stated that their education should include SCA, only half of all respondents felt adequately or better prepared in providing advice to their patients. This result is in conformity with those of previous surveys which found only 40%–60% of students felt adequately trained.,, Currently, standardized tobacco cessation educational curriculum does not exist instead tobacco use, and its effects are integrated into several chapters of the BDS curriculum. As part of the periodontology subject, smoking is identified as a risk factor for periodontal diseases, and there is emphasis given on the effect of cessation on treatment outcome throughout 3rd year, final year and during the internship. In the curriculum as part of oral medicine and oral pathology, the effect of tobacco on oral health is mentioned. During clinical postings of 3rd year, final year and house surgeons, chair-side teaching students are acquainted in details about the health consequences of tobacco use. In addition, deleterious effects of tobacco use and health promotion through camps and rallies such as on “world oral health day” (20th March) and world “No tobacco day” (31st May) are introduced as part of the public health awareness. The revision of the curriculum would provide an opportunity for greater emphasis to be placed on tobacco cessation as a core learning outcome. 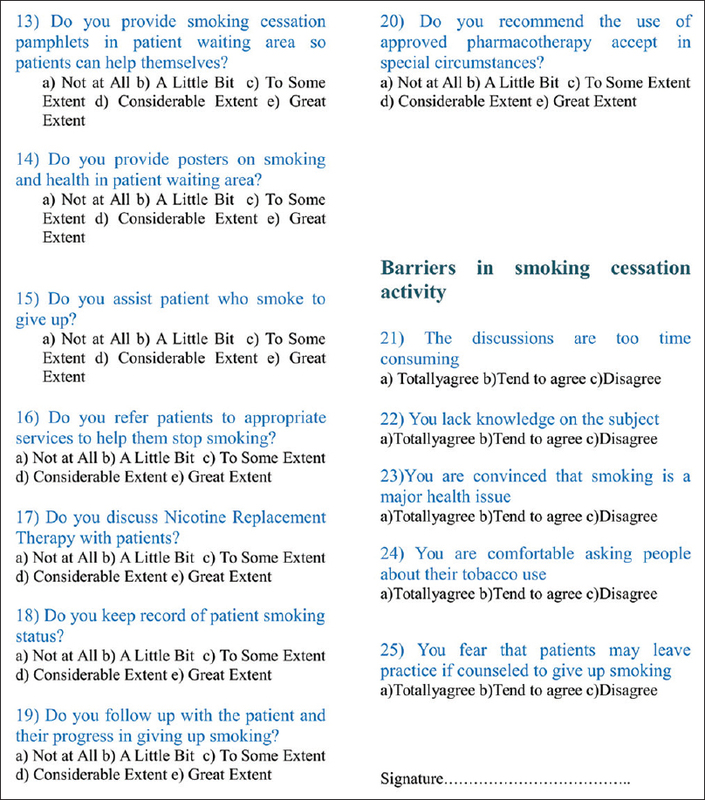 Until adequate emphasis is placed on integrating the principles and practice of providing SCA into the undergraduate experience including the existence of national specialist smoking cessation services, we can expect there to be a continued dearth of practitioners willing to undertake such work with enthusiasm. The authors would like to express their sincere thanks to all the clinical students who participated in the study. Thanks are also due to Dr. Ujjal Chatterjee, Principal, Hazaribag College of Dental Sciences and Hospital for the permission in conducting survey and Dr. Praveen Shrinivas, Secretary, Hazaribag College of Dental Sciences and Hospital, Hazaribag, Jharkhand for their help and encouragement. Amit S, Bhambal A, Saxena V, Basha S, Saxena S, Vanka A. Tobacco cessation and counseling: A dentists' perspective in Bhopal city, Madhya Pradesh. Indian J Dent Res 2011;22:400-3. Desalu OO, Adekoya AO, Elegbede AO, Dosunmu A, Kolawole TF, Nwogu KC. Knowledge of and practices related to smoking cessation among physicians in Nigeria. J Bras Pneumol 2009;35:1198-203. Twyman L, Bonevski B, Paul C, Bryant J. 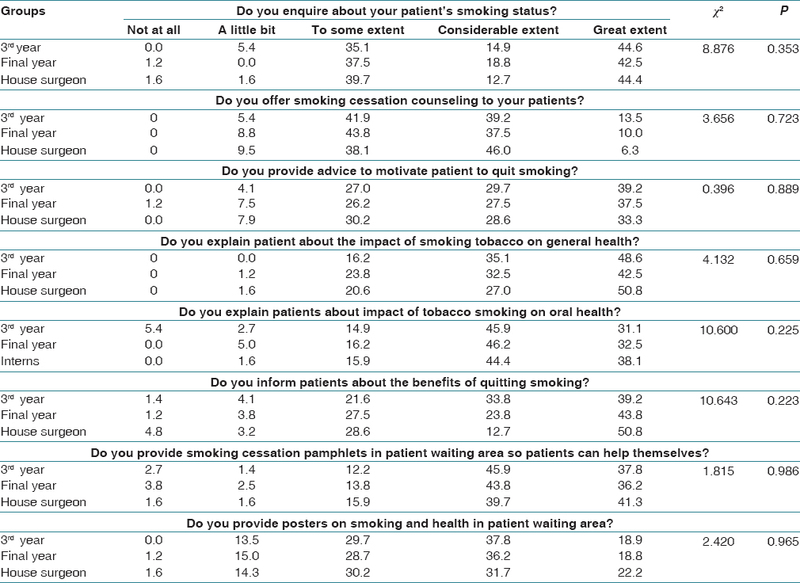 Perceived barriers to smoking cessation in selected vulnerable groups: A systematic review of the qualitative and quantitative literature. BMJ Open 2014;4:e006414. Albert D, Ward A, Ahluwalia K, Sadowsky D. Addressing tobacco in managed care: A survey of dentists' knowledge, attitudes, and behaviors. Am J Public Health 2002;92:997-1001. Ibrahim H, Norkhafizah S. Attitudes and practices in smoking cessation counselling among dentists in Kelantan. Arch Orofac Sci 2008;3:11-6. Sham AS, Cheung LK, Jin LJ, Corbet EF. The effects of tobacco use on oral health. Hong Kong Med J 2003;9:271-7. Raja M, Saha S, Krishna-Reddy V, Mohd S, Narang R, Sood P. Effectiveness of oral health education versus nicotine replacement therapy for tobacco cessation – A parallel randomized clinical trial. J Clin Exp Dent 2016;8:e64-70. Thawani V, Pande S, Turankar A. Pharmacotherapy for treating tobacco dependence. Indian J Pharmacol 2003;35:402-3. World Health Organization. WHO Report on the Global Tobacco Epidemic, 2008: The MPOWER package. Geneva:World Health Organization; 2008. Warnakulasuriya S. Effectiveness of tobacco counseling in the dental office. J Dent Educ 2002;66:1079-87. Rice VH, Stead LF. Nursing interventions for smoking cessation. Cochrane Database Syst Rev 2008;23:CD001188. 2008 PHS Guideline Update Panel, Liaisons, and Staff. Treating tobacco use and dependence: 2008 update U.S. public health service clinical practice guideline executive summary. Respir Care 2008;53:1217-22. Walsh MM, Ellison JA. Treatment of tobacco use and dependence: The role of the dental professional. J Dent Educ 2005;69:521-37. Martin LM, Bouquot JE, Wingo PA, Heath CW Jr. Cancer prevention in the dental practice: Oral cancer screening and tobacco cessation advice. J Public Health Dent 1996;56:336-40. Chestnutt IG. What should we do about patients who smoke? Dent Update 1999;26:227-31. Davis JM, Ramseier CA, Mattheos N, Schoonheim-Klein M, Compton S, Al-Hazmi N, et al. Education of tobacco use prevention and cessation for dental professionals – A paradigm shift. Int Dent J 2010;60:60-72. Singleton JA, Carrico RM, Myers JA, Scott DA, Wilson RW, Worth CT. Tobacco cessation treatment education for dental students using standardized patients. J Dent Educ 2014;78:895-905. Huggett KN, Westerman GH, Barone EJ, Lofgreen AS. Substance use and dependence education in predoctoral dental curricula: Results of a survey of U.S. and Canadian dental schools. J Dent Educ 2011;75:1003-9. Mecklenburg RE. Tobacco prevention and control in dental practice: The future. J Dent Educ 2001;65:375-84. Wyne AH, Chohan AN, Al-Moneef MM, Al-Saad AS. Attitudes of general dentists about smoking cessation and prevention in child and adolescent patients in Riyadh, Saudi Arabia. J Contemp Dent Pract 2006;7:35-43. Brothwell DJ, Armstrong KA. Smoking cessation services provided by dental professionals in a rural Ontario health unit. J Can Dent Assoc 2004;70:94-8. Mullins R. Attitudes and smoking habits of dentists in Victoria: 16 years on. Aust Dent J 1994;39:324-6. Tomar SL. Dentistry's role in tobacco control. J Am Dent Assoc 2001;132 Suppl. 1:30S-35S. Skegg JA, McGee RO, Stewart AW. Smoking prevention: Attitudes and activities of New Zealand dentists. N Z Dent J 1995;91:4-7. Clover K, Hazell T, Stanbridge V, Sanson-Fisher R. Dentists' attitudes and practice regarding smoking. Aust Dent J 1999;44:46-50. Stacey F, Heasman PA, Heasman L, Hepburn S, McCracken GI, Preshaw PM. 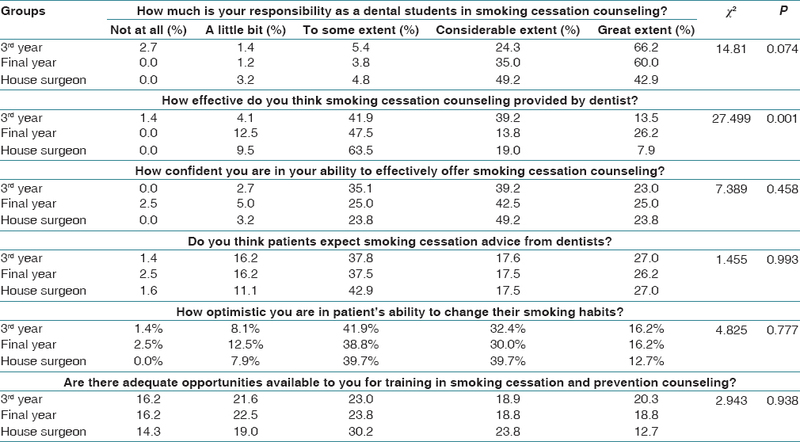 Smoking cessation as a dental intervention – Views of the profession. Br Dent J 2006;201:109-13. Logan H, Levy S, Ferguson K, Pomrehn P, Muldoon J. Tobacco-related attitudes and counseling practices of Iowa dentists. Clin Prev Dent 1992;14:19-22. Yip JK, Hay JL, Ostroff JS, Stewart RK, Cruz GD. Dental students' attitudes toward smoking cessation guidelines. J Dent Educ 2000;64:641-50. Cannick GF, Horowitz AM, Reed SG, Drury TF, Day TA. Opinions of South Carolina dental students toward tobacco use interventions. J Public Health Dent 2006;66:44-8. Chestnutt IG. Smoking and Oral Health. Cardiff University School of Dentistry; 2008. Binnie V. Smoking cessation. Br Dent J 2004;196:188.